This post includes some affiliate links, which means I earn a commission when you buy through my link (at no additional cost to you). You can learn more on my disclosure page. Thanks for your support of my website! Here are my favorite resources to grow your blog. I pay for premium tools because they save me time, money, or stress, but if you’re on a tight budget, I’ve got the perfect thing for you. 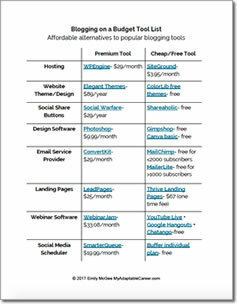 Download my list of Blogging on a Budget Tools to find cheaper alternatives to some of the tools I list below. There are tons of cheap options for web hosting, but I’ve learned the hard way that you get what you pay for. I’ve upgraded my hosting to WPEngine because the company automatically takes care of the nuisance tasks that I never made time for with my previous blog. They automatically add security measures to your website, so you never need to worry about hacking. Their proprietary caching and CDN systems keep your site running super fast, which is important for retaining visitors and ranking in search engines. And finally, they automatically back-up your site daily. Plus, any time you’re about to update a plug-in or theme, WPEngine reminds you to back-up your website again, just in case. This has been so helpful for me after plug-in updates have ruined some feature on my blog. I can just restore an older back-up and get my site back to normal. I hate to spend money, but when I invest, I want to invest in the best. With WPEngine, you get what you pay for: peace of mind and automation of some of the most essential, but annoying, back-end tasks. You can usually get your domain name through your hosting company, but most people buy it separately in case they ever want to switch hosts. So, I pay for my URL and through Hover. Hover added my domain to my hosting company (see above). I’m so un-tech savvy that I don’t even know what this process is called, but the folks at Hover and WPEngine walked me through it (for free)! Paying for a premium theme is important because it allows you customize your website and create a professional look. Before hiring a professional designer, I used the Divi theme from Elegant Themes, and it’s perfect for people (like me) who don’t know much about coding or web design. A subscription to Elegant Themes gives you access to 87 themes, so you have a ton of flexibility and can try out different themes all for the price of one.. But what I really love about Elegant Themes is the flexibility and ease of use. You’ll save time and reduce decision fatigue by using one of their dozens of pre-made layouts to help you quickly set up a beautiful homepage, portfolio, landing page, or about page. As for flexibility, Elegant Themes are designed to grow with you and your business. In the early days you can play around with the 87 themes. As you advance, video tutorials will help you learn how to customize EVERYTHING and create gorgeous, branded pages to meet every business need. If you’re serious about turning your blog into a business, then you need ConvertKit. ConvertKit is really an all-in-one service that is designed to help you grow your email list. It offers 4 landing page templates, 16 variations of opt-in forms, and tons of easy-to-use email features. You can send simple broadcast emails to your whole list, auto-deliver freebies to new subscribers, auto-send a welcome series or free ecourse, and segment subscribers based on their behavior. For more info, come check out my video walk-through of ConvertKit and read my review. ConvertKit is designed to get more people on your email list and keep ’em there. It’s also able to grow with your business, which will save you time (and headaches) in the future. Can’t afford some of these premium tools right now? No problem, I’ve got you covered with my Blogging on a Budget Tool List. 60 percent of my blog traffic comes from Pinterest, so I invest a little more money in my Pinterest marketing. With BoardBooster, I’ve set up a custom schedule to share my pins on 20+ group Pinterest boards. BoardBooster even lets me recycle the pins, so each pin gets repinned to each group board every month. This all occurs automatically, without me having to lift a finger. Since I started using BoardBooster, Pinterest has become my top traffic source and I’ve tripled the number of Pinterest followers I have. Get a free trial of BoardBooster by clicking here! If you take a look at one of my blog posts, you’ll notice the cute social share buttons that match my branding colors and count how many times each post has been shared. These share buttons are from Social Warfare. I like that the buttons are easy to customize, and that Social Warfare gives me more control about what gets shared. For example, I can pre-select the image that will be pinned whenever someone click on the Pinterest share button. So no more ugly or unrelated, or square pictures on Pinterest! Design is one of my biggest weak points, but Canva makes it easy (and cheap) for me to create my own graphics. They have premade templates and tons of free photos, icons, shapes, and fonts you can use to make your own images for every social media platform and your blog. I recently upgraded to Canva for Work because they let you save your branding palette and custom templates, and they have a quick re-size tool so you can instantly create images that are optimized for each social media platform. Upgrading to Canva for Work saves me about 4 hours of work a month, more than worth the $12.95 monthly fee. Shameless promo time! This is my free 5-day email course, specifically designed for bloggers and solo business owners like you. Even better? Each lesson takes less than 10 minutes to implement. A planner is a great tool to help you stay organized and manage your time. I love the Erin Condren Life Planner (with the hourly layout) because it helps me prioritize and has plenty of space for managing my work and personal commitments. I also love that I can customize it and decorate it. Seriously, I could lose hours looking at planner stickers and accessories on Etsy. :p I’ve spent a lot of time trying various planners, and this has by far been the most useful for me. To keep my planner organized, I use a different color pen for different types of tasks. For example, I write down appointments using a red pen, work tasks in purple, and personal tasks in green. Color coding tasks helps me see how I’m balancing my time. Plus, the fact that the pens are erasable makes it easy to make changes on the fly while keeping my planner tidy. Looking for more time management and productivity tools? Download my FREE Time Management Toolkit. It includes 9 essential tools to help you master time management. Plus, most of these tools are free! After I started growing my email list, I didn’t know what to do with that list. I mean, hypothetically, I knew what to do. I was supposed to email my subscribers, turn them into brand loyalists, and then sell them things. Well, let me tell you, the process of growing your list, turning them into raving fans, and selling to them is not as simple as it sounds. Email Lists Simplified helped me figure out EVERYTHING related to email lists. I learned how to make better opt-ins to attract more subscribers. I learned how to get my readers to actually respond to me. I learned how to write a sales funnel to convert readers into buyers. This course really changed everything for me. To see my results and review, check out this blog post. Find Your Tribe Online is an amazing resource if you’re a) new to blogging or b) an experienced blogger who wants to save time. So, that’s basically all of us. In this course and ebook you get access to a spreadsheet with links and instructions for joining group boards and Facebook groups in your niche, plus a list of some of the biggest blogs in each niche, in case you want to guest post. After buying Find Your Tribe Online, I was able to join a dozen Facebook groups and close to 20 new group boards in about 30 minutes. It was so worth it to not have to search for all those groups! I bought the ebook of FYTO, but the course is perfect for new bloggers. It includes scripts, checklists, and video tutorials to help you find your ideal audience and grow your traffic and blog. This is my signature business planning course for bloggers. If you’ve ever felt like you could reach all of your blogging goals if only you had more time, then this is the perfect course for you. In Planning for Success, you’ll learn proven time management strategies to help you create the perfect schedule and reach your goals fast. The four course modules will help you clarify your big goal, prioritize your endless to do list, and create the optimal schedule for your busy life.